HP has introduced several new computers that will serve as the foundation of their Windows 8 lineup next month. A dozen new systems and accessories were recently unveiled and to sweeten the deal, HP is offering 200MB of free 4G data each month from T-Mobile in addition to 25GB of free cloud storage from Box with the HP Pavilion dm1. The new systems feature either third generation Intel Core processors or A-Series chips from AMD. HP’s high-end notebook is the thin and light m4. Priced at $899, this portable ships with a brushed aluminum design, Intel Ivy Bridge processor, optional backlit keyboard and a 14-inch display. The m4 also includes a number of HP software that we’ve seen with other systems such as ProtectSmart and CoolSense, just to name a few. 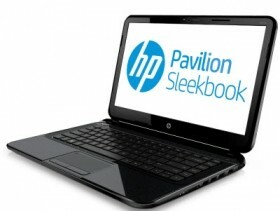 Other consumer notebooks include the HP Pavilion Sleekbook 14 ($449) and the Sleekbook 15 ($559), both available in black or red with 14-inch and 15.6-inch displays, respectively. Both systems can be configured with up to 1TB of storage and ship with standard HD webcams and Dolby Advanced Audio. If it’s a gaming desktop you’re after, the $899 Envy Phoenix h9 could be worth a look. The exterior is designed with a bit of flare courtesy of an “armor-plated design” while inside, we are told HP did a bit of cable management on your behalf to improve airflow and cooling. There’s room for up to three hard drives in addition to the ExpressCache solid state drive and buyers can choose either an AMD or Nvidia graphics configuration. Business-minded users have a selection of new desktops and notebooks to consider as well. The $539 HP Compaq Pro 6305 Desktop PC is compatible with a number of different AMD CPUs while the HP ProBook 4445s, 4446s and 4545s all offer AMD processors and graphics. Pricing for this line of enterprise notebooks starts at just $449.